Professional video editing made exporting easy. After you have finished editing and grading your video footage, you need to output your video footage for further operation. However, many users don't know how to export video in DaVinci Resolve. In fact, it is so easy to do this. In this post we are going to explain everything about exporting or delivering on DaVinci Resolve. If you want to upload the clips directly on YouTube then consider using Wondershare FilmoraPro, which is designed for both Windows and Mac users. After completing the editing job you will be able to save your project files in more than one way: uploaded them to sites like Vimeo, YouTube and other video sharing sites. You can also create or edit preset to save it for next time. Exporting your video files on the Wondershare FilmoraPro is a matter of simplicity. Download it now (Free). After you have edited and graded your project, now it’s time to render it or save it and share with your friends or deliver it to your client. Below are the steps to render and save your videos in Davinci Resolve. 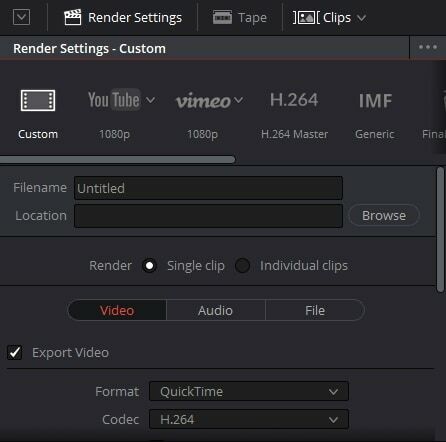 The specific settings in the Render settings may differ depending on whether you are using DaVinci Resolve 12.5, or DaVinci Resolve 14 or the newly released DaVinci 15. For example, in DVR 15, you can now export your video footage to IMF format. But most of the exporting steps are the same. Note: If you are running Windows 7, you may not be allowed to export the video in 4K resolution as DaVinci Resolve may not support it. Step 2: Select Render Settings from the Deliver interface toolbar. The Render Settings panel includes all render settings that are available for rendering jobs in Resolve. Click on “Advanced Settings” to get more. Step 3: On the top left there are all the export options such as YouTube, Custom, Vimeo, FCPx XML, Premiere xml, Pro Tools, Avid AAF and only audio. These options mean that you can export your video footage to social media like YouTube and Viemo directly from DaVinci Resolve, what’s more, you can also export your project as FCP XML to use it later in Mac Final Cut Pro. If the project needs to be deliver to another person who is using a different editing software such as Premiere, you can also export an XML project by clicking the Premiere XML icon. You can also save your media in Audio file only by clicking the Only Audio option. Custom: Here you need to manually select the options and setting that you need. YouTube 720P: This would give you the right settings for delivering your clip as QuickTime H.264 encoded file which is apt for uploading to YouTube. You will get a resolution of 1280x720. Vimeo 720P: This is just similar to the above export option. You can change the resolutions between 720, 1080 and 2160P for YouTube and Vimeo options. If you will use a specific setting group repeatedly, you can set it to a custom Easy Setup for future operation. Step 4: Now you need to choose the rendering location by hitting on Browse for selecting the destination of the file. Out of the various available options under Render Settings there are 2 which would come in real handy for rendering your project. Single Clip: Selecting this option in the Output parameters would allow you to set up the render where all the clips are output together in the form of one media file in your chosen format. Individual Clips: Selecting this option would set up a render where the individual clip will be rendered into individual media files in your chosen format. Step 5: The Export Video option in the video panel has to be turned on for rendering the source video. In case you want to export just the audio then choose Audio Panel and switch on the Export Audio option. Step 6: Once you have selected your export settings you need to hit ‘Add to Render Queue’. Step 7: Click ‘Start Render’ and all you need to do is relax till DVR finishes the task of exporting your clips. Note: All jobs created in Render Settings come in a single output by default. In case you need to deliver various versions of the media, then you have the option of creating multiple outputs. If you want to add extra outputs in rendering, you can select Create Additional Output from the option menu of Render Settings. You can export project to MP4, AVI, MOV... The line of numbers below the Location and File name controls would allow you to open all the individual output so that you can adjust their settings. You can choose as many outputs as you need. In case that you are using a new DaVinci Resolve version, like DaVinci Resolve 15, and still has some question about how to render and export videos in Davinci Resolve 15, please let us know. If you think DaVinci Resolve is not easy to learn, we recommend using FilmoraPro. It is a professional video editor that can be used easily. You can fastly export MP4, MOV and more formats. Download it to have a try (Free)!